Sydney Metro Airport Bankstown services the needs of metropolitan Sydney and New South Wales, in freight, emergency services, charter and flight training. The Airport’s modern facilities are home to over 180 thriving businesses ranging from multinational aviation companies to freight operators, MRO and manufacturers. The Airport has three runways. 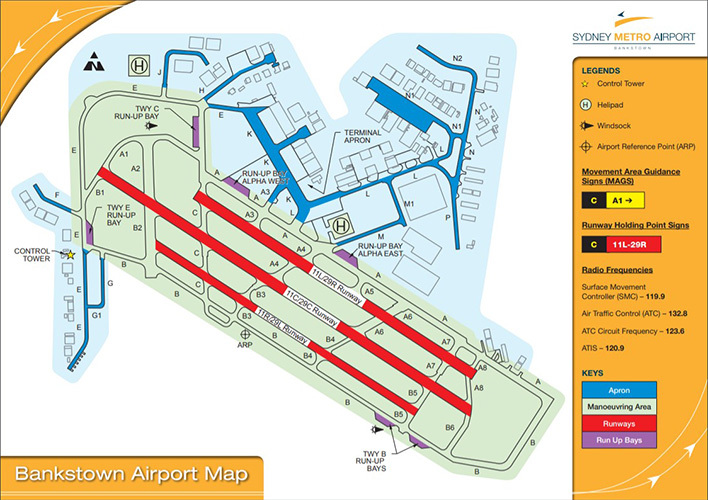 The primary runway (11C/29C) is 1416m x 30m and is rated up to 20 tonnes MTOW, with exemptions possible for higher MTOW. Please contact the Aviation Team if you would like to apply for the MTOW exemption. Selective taxiways and aprons are rated up to 20 tonnes MTOW Further details can be obtained in the ERSA. Runway 11C/29C has three stage medium intensity edge lights and a Precision Approach Path Indicator (PAPI). Sydney Metro Airport Bankstown has its own dedicated Air Traffic Control Tower, operated by Airservices Australia, and uses Class D airspace procedures outside Air Traffic Control hours the airport operates under CTAF. The operating hours for the tower are published in the ERSA. Bankstown has a Non Directional Beacon located at the airport. It also has an NDB and RNAV instrument approach for RWY 11C/29C. Sydney Metro Airport Camden is a General Aviation airport, hosting small aircraft operations in the commercial, private, sports and recreational aviation areas. It has a reputation as Australia’s leading sports/recreational aviation airport. Sydney Metro Airport Camden is served by four runways, two for powered fixed wing aircraft and two for gliders. The following summarises the physical characteristics of each runway. Runway 06/24 has a sealed asphalt surface and is the main runway for aircraft movements at the Airport. In the 24 direction the threshold is displaced 429 metres. The runway is reserved for powered fixed wing aircraft and meets Civil Aviation Safety Regulations Part 139 standards for a Reference Code 2 runway. Runway 10/28 is a grass surface runway. The runway is reserved for powered fixed wing aircraft and can only be used during daylight hours under visual conditions. 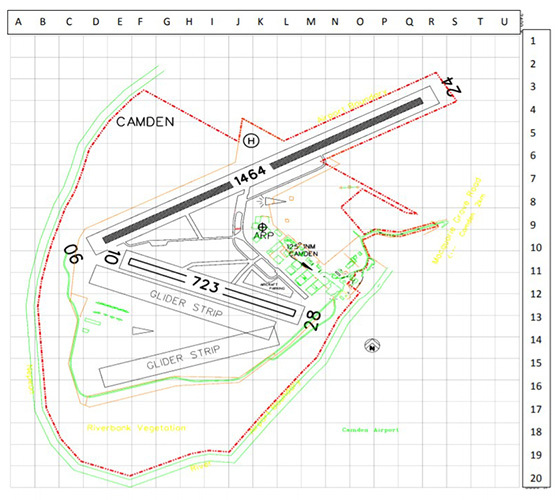 There are two grass surface runways at Camden reserved for glider operations. One runway parallels the paved Runway 06/24, while the other parallels Runway 10/28. Both glider runways are located to the south of Runway 10/28. None of the runways are equipped with landing aids but an illuminated wind indicator is provided. There is a designated helicopter landing site with a grass surface to the north of Runway 06/24. Further details can be obtained in the ERSA. The supporting taxiway and apron network is capable of accommodating aircraft to 5.7 tonnes MTOW. Runway 06/24 has three stage low intensity runway edge lights. Sydney Metro Airport Camden has its own dedicated Air Traffic Control Tower, operated by Airservices Australia, and uses Class ‘D’ airspace procedures. The operating hours for the tower are published in the ERSA. A Non Directional Beacon is located at the airport with the frequency detailed in the ERSA. For information on refuellers based at Camden Airport please refer to the ERSA for further details. Hardstand parking is available along TWY K.
Grass parking is available along TWY’s L and M.
Both short term and long term parking is available on the grass areas provided.